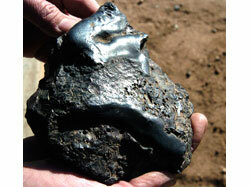 Couple Find Possible Meteorite in Their Yard in	California? [meteorite-list] Couple Find Possible Meteorite in Their Yard in	California? your front yard, just inches from your front door. That's what Kay and Rick Green of Hesperia believe happened to them. Then he decided to dig it up. "I thought it was a tiny piece. I was surprised to see how big it was." scale, and it weighed a little more than 5 pounds. weight for its size, its coloring and contours.